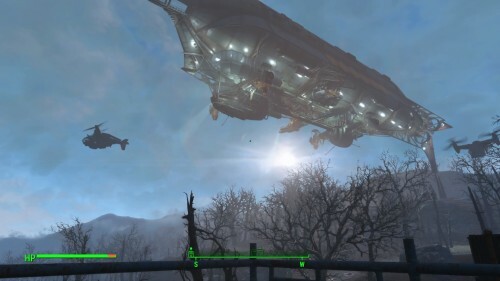 These days, discussions of the UFC’s Middleweight division are comparable to that of Fallout 4’s wasteland. These are all statements that could easily apply to the Middleweight division or Fallout 4‘s Commonwealth. To onlookers, it is a desolate wasteland filled with corruption, danger and mutated monsters with reputable and inspiring individuals few and far between. This weekend we were treated to some non-descript bouts in the 185-weight class, and, not to sound too negative, I had to use Thesaurus.com to look up synonyms for ‘barren’ when describing the division. Dana White’s mothership searching far and wide for Middleweight contenders. Jake Collier took Alberto Uda’s breath away in a TKO stemming from a body kick, while Chris Camozzi bloodied up Vitor Miranda en route to a unanimous victory in a fight that had a lot less appeal in reality than on paper. Nonetheless, these were decent bouts on an otherwise forgettable card, besides Cody Garbrandt rolling over Thomas Almeida. We can now look ahead to UFC 199 to be disappointed in the weight-class, as well as the life-draining Middleweight rankings that presents reminders of what it once was. One look at these and you’ll start to see what I mean. From the forgotten to the ageless to the, well…positively-tested. I can feel all your collective eyes hoping the top three fighters stay healthy for years to come. Thales Leites and Tim Kennedy have been forgotten by most, while Silva, Belfort and Machida are a shadow of their former selves now relying on outside sources to remain in fighting shape. Uriah Hall is flashy and exciting, but enough to be champ? Don’t think so. Consider that he has been beaten by Robert Whittaker, who has lost to Wonderboy and Court McGee. Long story short, he has beat those he should have but not those he needs to. That leaves us with Mousasi, who (to complete the circle of life) has lost to Hall, and despite being hilarious can’t string enough consecutive wins together to get to the top of the rankings. Cue Dan Henderson v Hector Lombard which is bound to be a slug fest for one guy while the other tries to shoot once they start losing. These ageless wonders will put on a hell of a fight no doubt, but they aren’t exactly prospects-in-the-making at 45 and 38 years old respectively. If you are able to sit through the Cruz/Faber promos, you will notice Bisping is fighting Middleweight Champion Luke Rockhold. Take nothing away Bisping, we love him and he fought the fight of his life v Anderson Silva (we touch on that in the podcast). But again, do I think Bisping could defend his title against Jacare, Weidman or Rockhold again? No. 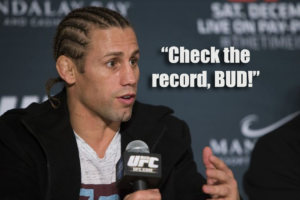 Alright Urijah we will. We promise! Watching Rockhold v Weidman, it’s apparent they are similar in talents but the champ is just on another level. I’m not convinced their cancelled rematch would go any different right down to Weidman professing his love for Jesus. This is where one hopes for Jacare Souza to breathe much-needed life into the division and create at least three-way scrum for the belt between himself, the Rock and Weidman. His performance versus Belfort at UFC 198 was rather impressive for a 36 year-old. If it wasn’t for his injury, Jacare may very be fighting for the belt this weekend. Here’s hoping he can mix it up at the top long enough for some new talent to make its way up the ranks. 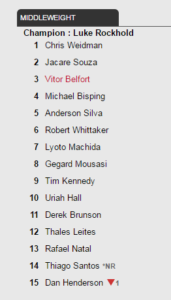 As it stands, no one in the top three to 15 stands any chance at unearthing UFC gold. Perhaps an interation of The Ultimate Fighter is needed. The last middleweights to coach were (you guessed it) Patrick Cote and uh…Kyle Noke (?) in Canada vs. Australia. Personally, I would like to see Mousasi as a coach but his dry sense of humour may not provide the sparks required for TV. If Bisping doesn’t win, it’s time to bring him back so he can pass the torch and then have a final fight and move to TV. Against who? None other than Anderson Silva in a Brazil v Britain show. That would set up the rematch of the fight Silva thinks he won and hopefully leave the door open for some brawling Brits and Brazilians in the middleweight division. Who do you think would make good TUF Middleweight coaches?